Rock Paper is made from crushed limestone. It is strong and waterproof, but soft and smooth to the touch. It has never been near a tree and not even a drop of water is needed to produce it. Rock paper is a sustainable alternative to ordinary wood fibre paper. The product is Cradle to Cradle certified and is therefore ideal for applications where sustainability is a high priority. 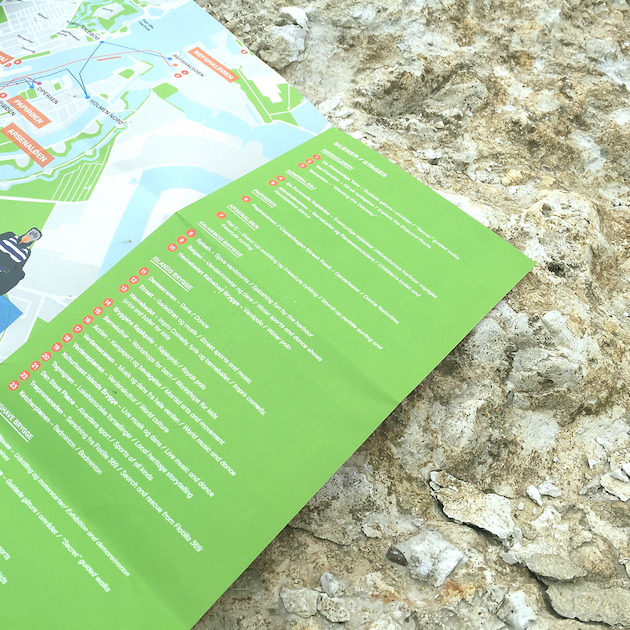 The paper's technical properties, including the fact that it is not affected by water, make it highly suitable for city maps, posters, hiking maps and other products used outdoors. Rock paper is a paper product comparable to conventional wood fibre paper. However, the rock paper is made using a different manufacturing process with unconventional ingredients. That gives rock paper a number of benefits in terms of quality and the environment. Rock paper contains no wood but consists of limestone and the binding agent HDPE (high density polyethylene). Limestone (CaCO3) is present naturally in the world. Under the Norwegian-Danish basin there's a layer of limestone 1000-2000 meters thick. Lime is naturally found in water and often appears as white deposits in domestic sinks. It makes up the support structure in coral reefs and it is produced continuously in nature. HDPE (high density polyethylene) is a petroleum based thermoplastic. HDPE contains no hazardous materials and when burned emits only CO2 and water. If rock paper is exposed to UV radiation, moisture and heat, it is biodegradable as UV rays burn off the plastic and leave only the lime. Rock paper is available in various thicknesses for various purposes.